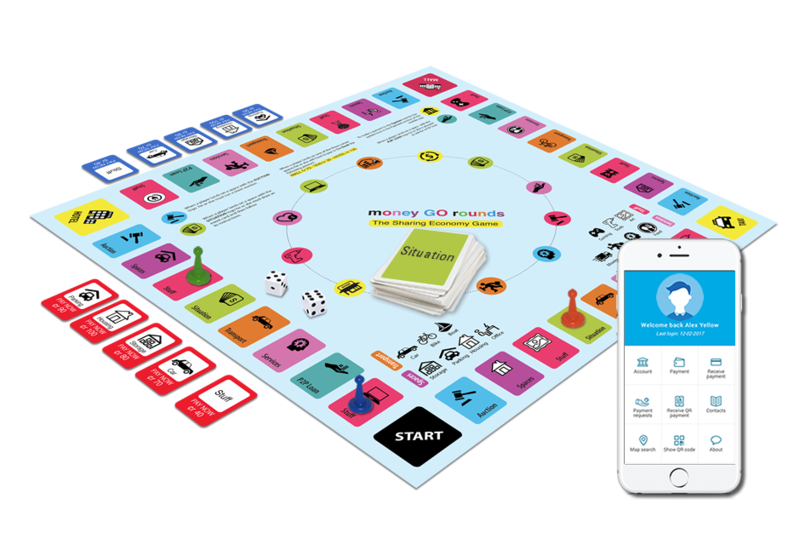 Money GO Rounds is a a board-game that let you simulate life in the sharing economy. Money GO Rounds enables the players to lend or borrow virtually anything, directly from each other. Items lent can be bycicles, appartments, parking spots, storage spaces, DVD's, books and tools. Each player has available a certain number of resources cards. Every time he lands on an available advertising space he can advertise a specific resource. Each card has a price tag and a QR code on the back. When some of the other players lands on that card, he will have to pay for the resource he is using. Payments are made using a smartphone with the Cyclos App. Once the player scans the QR code the payment goes through and the funds are taken from his account. The Cyclos App is used for making payments and for calculating of each player balance.